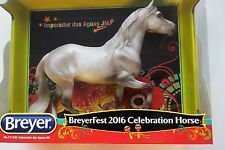 Breyerfest featured the Mangalarga Marchador as their Celebration Horse and 2016 Model. There were three Marchadors there at the show that posed for pictures and showed in the arena once a day. The USMMA represented our breed and our breeders at a booth during this July Event. Our booth was manned by Lynn Kelley, Victor Rosa, Sandy Hull and Rick Schatz. Rick drove all the booth materials from the Las Vegas PBR booth to Kentucky along with materials sent to him by other breeders and owners. The USMMA volunteers came at their own expense and worked Thursday, Friday, Saturday and Sunday. Thank you! 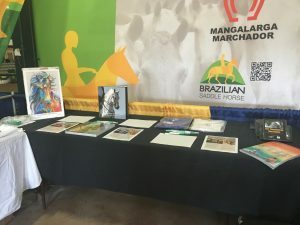 Represented in the booth were: The USMMA, Marchador Association, Canadian Marchadores, Flying Oaks Ranch, Future Foal, HH Sensing, Marchadors InMotion, Rancho de los Cielos, Saint Horse Marchadores, Summerwind Marchadors. We had giveaways - old calendars, pens, Shannon Ford Art postcards and magazines. That was in addition to the business cards and brochures. We also had larger prizes for a donation to the USMMA. The festival was very well attended. People who stopped in the booth were interested in the MM breed and some were looking to buy a horse so it was opportune that now they have another breed to consider. The MM BOOK was the big hit. Many people offered to pay the $100 for it, but we imported the last 4 copies of it. 2nd printing is planned. The USMMA brochure was a big hit - we only printed the inside page - the FAQs about the breed. We have pens, brochures and postcards left over for the next event. The Kentucky Horse Park is a venue where people expect to see many breeds. 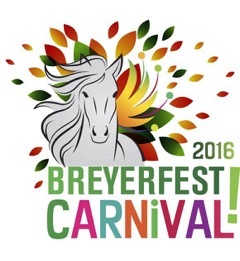 The Breyerfest horse show was all three days and presented Morgans, Friesians, Miniature Horses, QHs, Arabians, Standardbreds, Gypsy Vanners, Single Footer, Rocky Mountain Horses, Tennessee Walking Horses, Shires and more. (Of course, a Marchador too) We have an opportunity if we decide to return to show Marchador horses in the ring next year - both versatility and perhaps a demo with costumes and excitement!